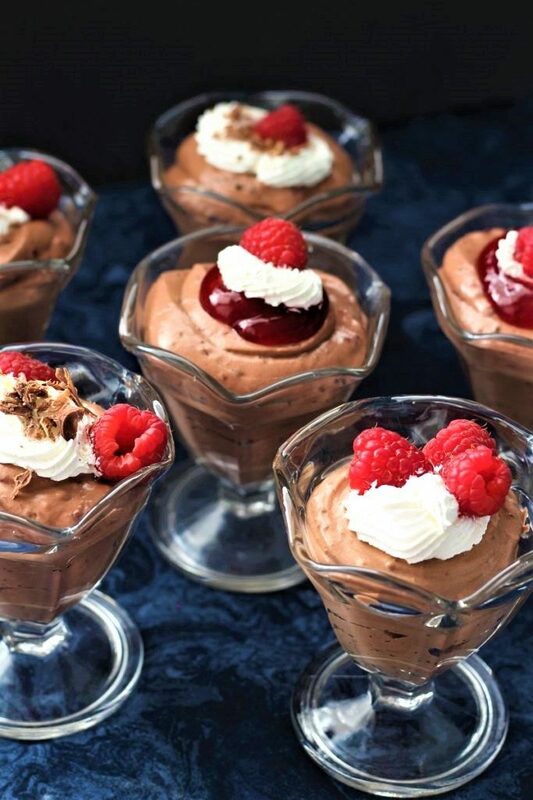 Mousse in a minute is a fancy, fast dessert that you can make in a matter of minutes. Top it off with raspberries, chocolate and extra whip topping. 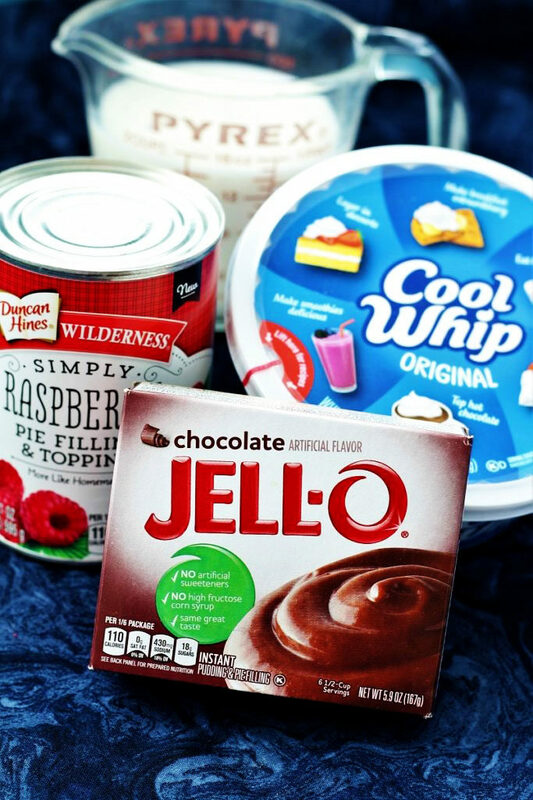 I am so excited to make this fun dessert for Valentine’s Day. And if you have children and want to make Mousse in a minute extra special, you could add a few sprinkles. However, I had scouts over the other day and let them decorate cookies, and let me tell you, they did pour on the sprinkles. Some of their cookies had at least a 1/4″ of sprinkles and sugar on top of them. I am not even kidding. I bet their mothers were happy with me. Yikes! Please do not tell their mothers. 🙂 Then after we decorated cookies we decided to heart attack a few neighbors. If you do not know what heart attack means, then I will tell you. We cut out hearts and then we wrote cute loving messages on the hearts, then we took painters tape and taped the hearts to their doors. I had to laugh, I told the boys that I was with, to be very quiet. So one of the boys takes the first heart, then a piece of tape and then he goes over to the door and pounds the heart onto the door so that it will stay. Ha ha. Anyway, it was a lot of fun, and every time I drive by their houses I see the cute hearts on their doors and I have to smile. It is good that we have some great programs out there that teach these young boys to serve, and how to love their neighbors. We are a very blessed people and I hope that we can see all of the good in the world. Now wouldn’t it be nice if we did not have to work, and we could just spend the day helping and serving our family and friends. I remember when I was young; a friend of mine and I, decided to do a similar act, and I even think it was for Valentine’s Day. We got in the car and drove 8 miles, (our neighbors were much more spread out when I was growing up in the country than my neighbors are here, closer to a city). We took a plate of cookies with a heart on, and placed it on their front porch, knocked on the door, and ran. I do not even think that they had a door bell. I know that I didn’t growing up! Anyway then we hopped in the car and drove down the road, turned our lights off and sat for a few minutes. Then after about 5 minutes, my mom turned the car lights on and we drove home. A few weeks later, this nice man asked me if I knew anything about the yummy cookies that had been delivered to his door? I was not a very good liar and so I told him “yes”. He smiled and said that he watched us go down the road and turn the lights off and then a few minutes later we turned then on and drove by his house. Do you have your Valentines all ready? What are some of the fun things that you like to do? I told my husband that I would plan Valentine’s Day and that he could plan our Anniversary. So, I have a gift card that someone gave me and so I will take him out to dinner. Then we will come home and have some of our mousse in a minute. I think that I will put a little extra cream on my mousse in a minute. That is what I like. I do not even care if it sprays out of a can, it is still yummy cream. Now I need to think of something to do for the grand kids! Send help; I have no clue. They do not need any toys and I am sure their parents will be happy if I give them some sugar! I guess I could take them to the store and let them pick out some veggies!!! However, I do not think that I would get grandma of the year if I did that. Maybe I could get them some string cheese or cheese and crackers or even some yummy animal cookies. I also like books, they are a lot of fun. The other night, I went and watched my daughter’s kids so that her and her husband could go out for dinner. I took some hearts and let the kids put hearts on their mom and dad’s door. It was so cute when mom and dad got home. The oldest daughter was telling which hearts she had done and then the almost 2 year old went over to the door and this is how she talks, “ssst”. She went over to the door and said ‘ssst” then she would put her hands on her heart and say “me”. It was the cutest thing ever. She was so proud of the heart that she had made. They also put one heart on each of their bedroom doors. Then the next day, the youngest one ripped the oldest ones heart and that was devastating. The oldest one cried, and her mom told the youngest that she was a heart breaker. I must say, that my daughter has her hands full, but just enjoy the moments because soon enough they will be grown and gone. 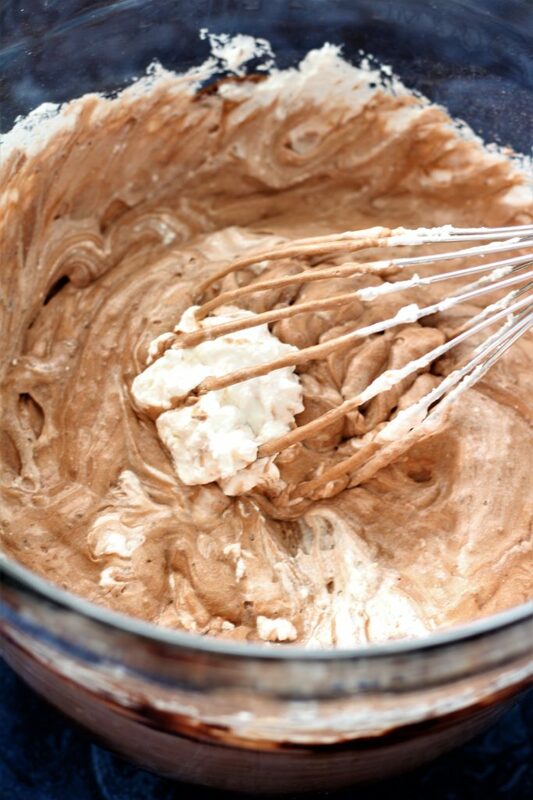 1- If you do not want whip topping, go ahead and use 8 ounces real whipped cream that you sweeten with 1/3 cup of powder sugar and 1 teaspoon vanilla. 2- Use any flavor of pudding that you like. 3- You may want to use any flavor of pie filling or you may want to leave it out all together. Prepare the pudding mix using the 2 cups cold milk. Fold in the pie filling. Then add the whip topping. Garnish with additional whip topping, raspberries and or chocolate shavings. Such a creamy and dreamy dessert! 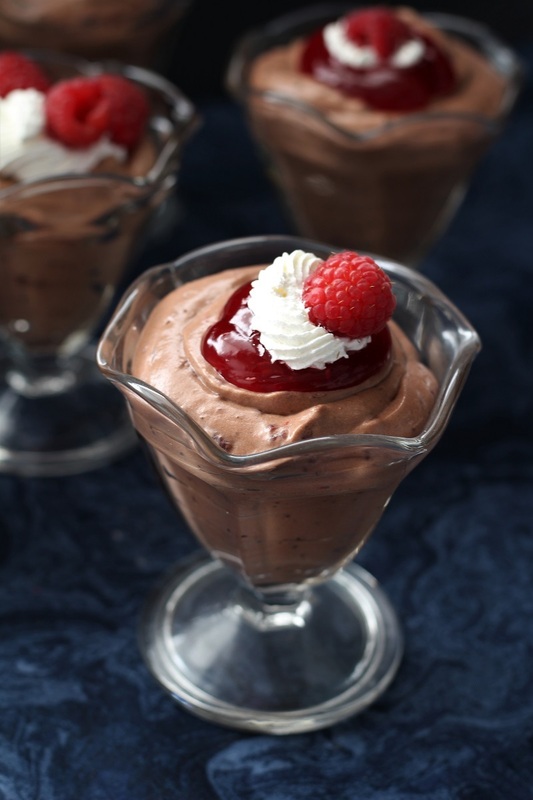 I have never made a mousse before and love how easy this one is to make! It was very tasty and like you said, “easy”. We busy women need easy. Oh, we would so get along! I love easy and delicious recipes. We are busy people! I thank you for stopping by and I hope you have the best weekend ever! Looks like a wonderful recipe and you made them look so pretty! Thanks for joining us at Best of the Weekend! Your recipe was one of my features this week! Thanks again for linking up and enjoy your weekend!